We can’t believe it’s already that time of year again and we have to plan for fall. 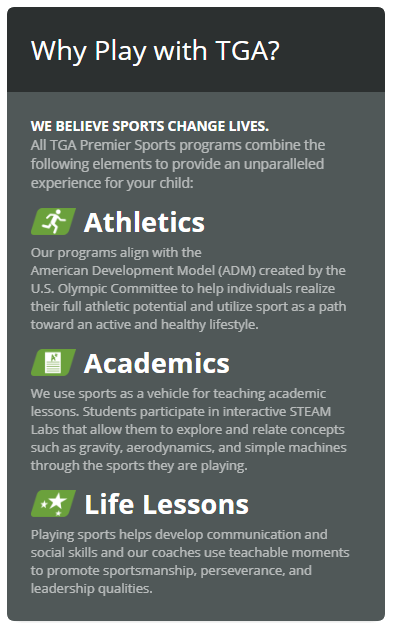 Lucky for you, we put together an FAQ about TGA’s sport enrichment programs to help you out. Q1) Does my child need to bring any equipment to school with him? Nope! TGA provides all necessary equipment. Q2) Does my child need previous experience in the sport? Another nope! Our coaches implement age and skill appropriate instruction through station-based activities. TGA programs focus on the fundamentals of our sports and both novices and more experienced players can work on improving their skills at the same station. Q3) What is included in the hour of class? The hour is broken up into three sections: Teach – Grow – Achieve. TEACH = Class begins with a dynamic warm up and the introduction of the skill(s) of the day. GROW = Students rotate through stations where they practice the core skills and learn about different aspects of the game including rules, etiquette, and academic-based lessons. ACHIEVE = Each class ends with a game/contest where students can showcase their skills. Q4) Who is teaching the class and what’s the student to coach ratio? TGA coaches are background checked and trained to make the class safe, fun, and age-appropriate. There’s a maximum of 10:1 student to coach ratio, meaning each child gets ample attention. Q5) My child has already done your enrichment program – why should I sign him/her up again? Every child learns at their own pace and it takes plenty of practice and training to get really good at any sport. Returning students continue working on the same core skills each session, but our coaches add on more advanced instruction and challenges as each player’s skills progress. Q6) What comes after finishing an enrichment program? Afterschool enrichment programs are the first stop on our player pathway. These programs are great entry points into new sports because we bring them directly to you right after school. Now is a great time to sign up for an afterschool enrichment program for the fall. Contact your local chapter director with any questions.